Borbeck Castle is situated in a beautiful park in the title of the German city of Essen. Borbeck is another historic landmark in this town in Germany, which is a unique place to visit if you want to learn more about the history of the country. Along with the beautiful Villa Hügel, Borbeck Castle is another mandatory stop if you want the most complete sense to explore the Autumn. Borbeck brings its long history, which is closely linked to the abbey of Essen. For more than 14 centuries, Borbeck was the residence of many religious heads. 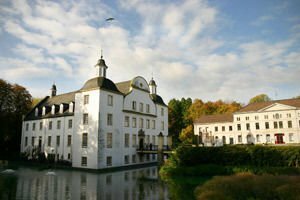 Only in the 18th century castle Borbeck acquires the appearance, which has managed to be maintained till today. During the 14th century Borbeck became a favorite of wives and daughters of employees of the abbey. According to documents saved in 1372 it was first mentioned as a castle, which means that at the time of construction Borbeck was already an impressive stable which had been strengthened. In the period before that date, the estate was used as both Court and as a residential building. During the 15th century, Abbess Sophia von Gleichen started minting coins with the image of Borbeck which were known as Borbecker Gulden and Borbecker Groschen. In 1493 the castle suffered huge damage after a fire. Following the Spanish invasion Borbeck was almost destroyed. The manor was again reborn after Princess Abbess Elisabeth von Manderscheid-Blankenheim took over a major restoration and expansion in 1598. Restoration during the 18th century bequeathed to a large extent the shape and style of the Borbeck Castle which has survived until today. All repairs, renovations and extensions of the estate are due to the abbess, who lived there and created a monastery. Since 1920, Borbeck Castle was opened for public visits against an entrance fee. In 1941 the management of Essen purchased the mansion from the Fürstenbergs family, to deploy it in the city offices of administration in the 50's and 60's of last century. During that period much of the values and decoration of the mansion were deleted. In 1983 Borbeck Castle had space for public meetings and events for the citizens of Essen. Since then the castle has been a place for all kinds of cultural events - weddings, conferences, musical performances, etc. A few years ago, a restoration that returned forms of the baroque castle from 1744 and 1762 was formed.